Oil on cardboard, 28 x 15 cm. 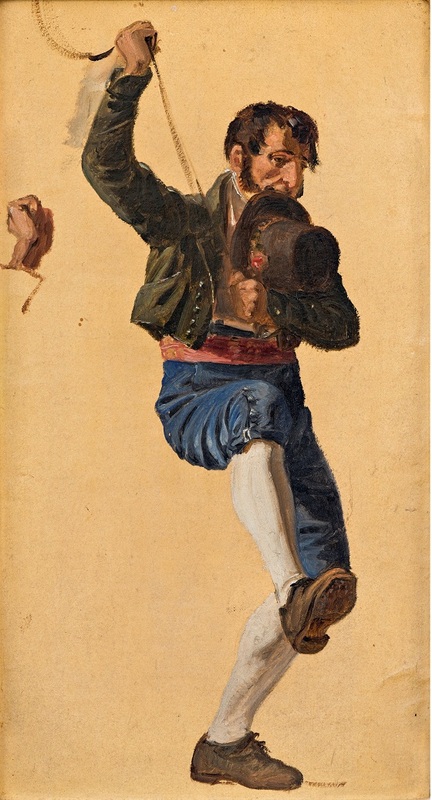 This painting of a coachman is a prestudy to the major work entitled The St. Anthony Feast Day in Rome from 1838. In the final work, the Italian coachman is struggling to get his horse and carriage going. The left wheel of the carriage has gotten stuck behind the stone doorstep to the Saint Anthony Abbot on the Esquiline. The man desperately whips his donkey, hoping it will pull the carriage free. The donkey has been brought to the church to be blessed by a priest, as was customary on the Feast Day. Saint Anthony was seen by Catholics as the protector of animals and every year on 17 January, it was customary for both the wealthy urbanites and peasants from the surrounding districts to travel to the Saint Anthony Abbot on the Esquiline to have their animals blessed. The sketch shows how Marstrand instructed his model to stand in a position that was predetermined for the final work.